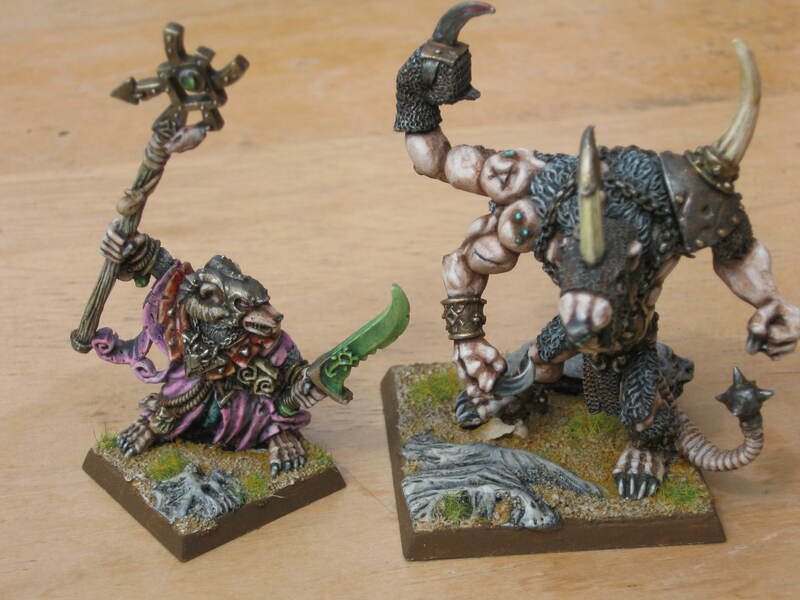 This is a bit of request for someone who's more familiar with the game to design hero rules for Thanquol and Boneripper as i'd really like bringing my models to a game but really wouldn't know how to balance them! As someone suggested to me having them as a duo like the Excelsior Warpriest and his Gryph-Hound would be really nice! As a Skaven Caster, he should have a high-ish Agility and low Save. Probably 6+ Save and 3+ Agility. 6+ Save is pretty standard for Caster type characters, so not really much to explain there, and I'm thinking 3+ on the Agility to keep him relatively mobile and help to keep away from adversaries. He should really be focusing more on keeping away from enemies than taking a more stand and deliver stance. Similarly, Skaven generally have Move 4, and I don't think there's anything about Thanquol that indicates he should be particularly fast for a Skaven, so Move 4 is good there. So, we have Move: 4, Save 6+, and Agility 3+ (though the last may drop to 4+ after some testing). For his special abilities, I would focus on Boneripper. 2+ to control Boneripper, and probably either a 5+ or 6+ to resummon him. Pretty straightforward, and pretty standard wording from the Excelsior Warpries/Gryph Hound and Necromancer/Skeletons. 6: Move and attack Adversary of choice. This is, of course, a first draft off the top of my head, but it should be somewhat close to a usable character. Of course, Boneripper is going to be the one to focus on to make the character truly unique. If you want to stick more to the "official" rules and such, the Silver Tower phone app has a bunch more Heroes that you can get access to for a couple dollars each. One of these bonus characters is indeed a Grey Seer which you could easily use the Thanquol model for. This is a topic near and dear to my heart though as I'm a long-time Skaven fan, with Thanquol being my all-time favorite Warhammer character. So I'm curious to see some variant ways people come up with. While we're at it we need Snikch done up good and proper! For boneripper... I am thinking he would gain his own renown (thus the renown ability on Thanquol.) and it would change his Table and unlock abilities as he gains. Also there is no command action purposely. he will begin a bit random but as things happen he will become more workable..
Wow that was really quick! Looking really nice.